Remember, the two inner circles are always in the same stitches – Open Chain Stitch, and Stem Stitch. 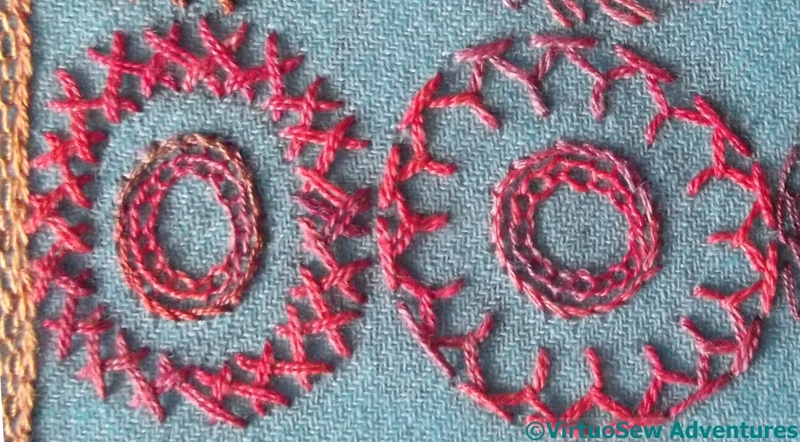 The two outer circles in this case are in Herringbone Stitch, and Half-Chevron Stitch. I’m a little disappointed that neither the counterchanges of colour nor the counterchanges of thread seem to show in this photo. I assure you, they were there when I worked it! The first of these is Breton Stitch, which is a little like Herringbone stitch with added twist. I’m sure I could have done it with the twist towards the outside, but I think like this, it will balance some of the other circles which have a strong edge. The second is Wheatear Stitch, which I have found myself turning to every now and again, although maybe not often enough. It produces a spiky but continuous line, so while it has definite uses, it is also one which doesn’t work in all contexts. That said, I enjoyed working it, so maybe I will be able to tweak either the context or the stitch, so as to use it more…! This pashmina is going to be quite the stitch sampler, isn’t it! They are beautiful! 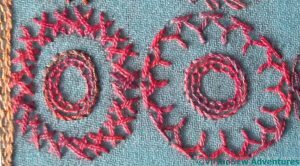 I love reading about the different stitches because I don’t work in that venue and I alway learn something. I think a wearable stitch sampler is a great idea: when it’s not inspiring your work, it can keep you warm. Or even do both at once. Breton stitch is new to me. I shall have to have a play with it. I think you can see the changes if you look closely enough, but perhaps you need to know what you’re looking for on a small photo??? Can’t wait to see it when it is finished! The different stitches give great texture. Loving all these different stitches. Seeing them in the flesh is really inspiring me to expand my repertoire! 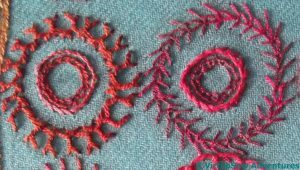 I love the idea of a Pashmina as a stitch sampler….